with pet chickens and daughters Ameilia and Charlotte. Portrait above courtesy of Justin Clemmons. 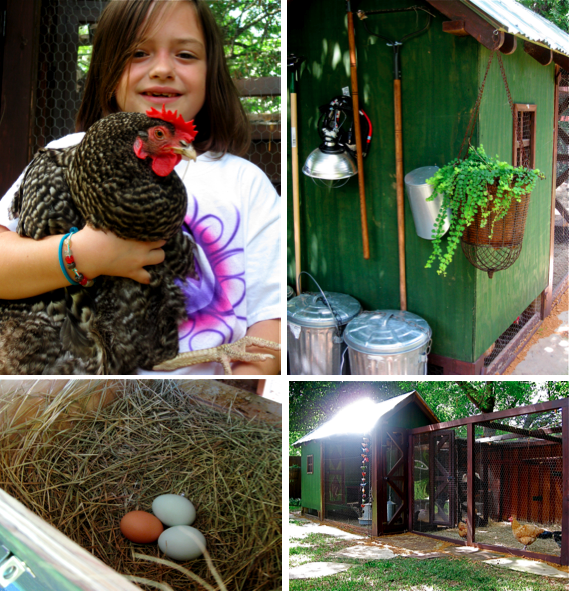 It's all the rage ... backyard chicken coops! Gallery owner Lisa Brown of Dunn and Brown Contemporary had a custom coop built for the 1948 Greenway Parks cottage she shares with husband Chuck and daughters Amelia and Charlotte. 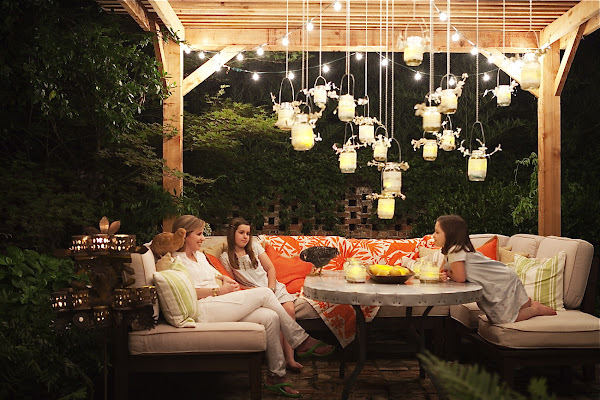 What started out as a school project for one of her daughters at Lamplighter several years ago has turned into a backyard boutique hotel for designer chickens. Artist Helen Altman, who is represented at Dunn and Brown, also keeps chickens and advised Lisa on the design of her coop and what breeds of chickens to get. David Alkire built the coop, which houses about 14 exotic egg-laying hens, including pearl white leghorn, Ameraucana, light brahma, Rhode Island red, and buff orphington. The chickens, which produce about a dozen eggs a day (fewer when it's really hot out) are fed organic scraps from Whole Foods, supplemented by meal worms and crickets. "They love kale," says Lisa, who went totally organic because of the chickens. They no longer fertilize the grass or uses a mosquito system. "We all just love watching them. It's a family affair every Sunday morning, we clean the coop together." After gathering the eggs each morning, the Brown children put them in recycled egg cartons like this one above, custom stamped "Brown Eggs" and give them to friends and neighbors. Freshly gathered eggs produced by the family's exotic chickens range from pale green to reddish-brown. Where to Buy .... If you're interested in setting up your own backyard coop, My Pet Chicken is an online site that carries a variety of coops, supplies, and -- although I can't imagine this -- ships exotic baby chicks, juvenile chickens, and fertilized hatching eggs. Better yet, if you're in Dallas, landscape architect Robert Bellamy has set up several chicken coops for clients and can help you get exotic hens locally, which seems more humane. Step Inside ... The Browns renovated their 1948 cottage ten years ago, which was built by legendary oilman Clint Murchison, Jr., who got some design inspiration from his friend, architect Bud Oglesby. They kept as many of the original design details as possible, such as the brick wall in the living room, which Lisa painted Sherwin Williams's linen. Lisa says she was introduced to Swedish antiques by former neighbors Shannon and Andrew Newsom, who own Wisteria. "I fell in love with it. They're like works of art for me," she says. Shannon's mother, designer Jane Moore of Houston, spent a day advising Lisa on what to buy and letting her choose from antiques she'd brought over in a container from Europe. Other pieces Lisa had custom made, such as the zinc dining table. The washable, kid-and-pet-proof slipcovered furniture is from Quatrine. "I tried so hard to introduce color with art, but I always ended up choosing the most muted palettes. Even with David Bates, who uses a lot of color, I managed to find the only gray and white piece he's ever done," says Lisa of Grass, the somber painting Bates made of his and his father's hands. One side of the canvas has Bates' own fingerprints. Bates father died while he was in the middle of painting a body of work that included this piece, and Lisa says he destroyed most of the paintings from the period. on the coffee table in a handmade box by the artist. pin cushion and ribbons (she loves to sew) and baby chicks. Lisa deals in art by day, so at home she wanted her house to feel like home. "I didn't want to feel like I lived in an art gallery. People can't believe I don't have fancy art lights. And some walls I intentionally left blank," she says. The brick wall posed a challenge. "I'm used to pristine white walls at work. The brick really stumped me for about six months," she says. Eventually with the help of a friend, Lisa created a striking vignette of wire birds from artist Helen Altman, a simple wood bench from Wisteria , and the David Bates painting. "I truly love all the pieces in my house," says Lisa. "I have never bought art to match a pillow or a couch. I'm naturally drawn to certain objects and palettes." One of two Devon Rex cats that live in the Brown household. Wooden bowl and books from Wisteria; antique wood hand from The Mews. 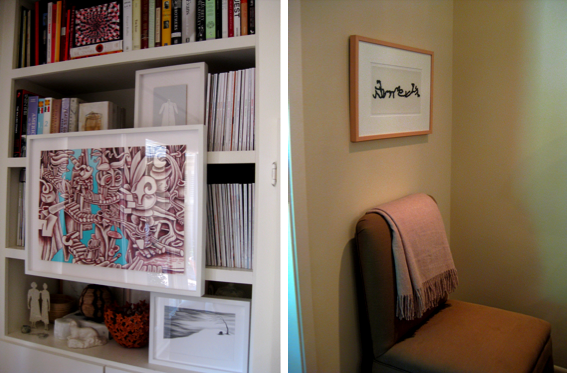 Lisa has a large collection of contemporary art, much of which she keeps in storage. "My art at home is not edgy because of my children," says Lisa. "I'll introduce more stronger or more politically based art when it's appropriate, when they're older. I have a lot in storage, just waiting..."
"I will never hang a piece of artwork over a fireplace," declares Lisa, who created a beautiful backdrop instead. She plastered over the bricks to create a smooth surface, and then came up with a burnished amber color by mixing various colors of wood paint, then rubbing it on by hand. It was trial and error. "It's the Home Depot Venetian plaster look," she says laughing. Lisa learned to mix stains and paints while studying studio art at SMU. 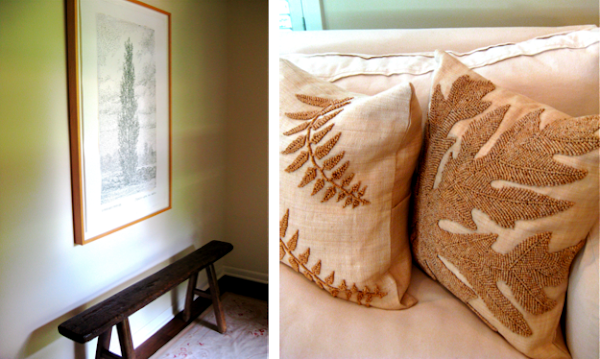 At left, artwork and an antique bench set the tone in the entryway. A fire destroyed much of the kitchen right before the Browns purchased the house, but they were able to salvage the cabinets, which Lisa redid with glass doors. She had a contractor install cubby storage above. Quilted stainless steel, similar to what construction site catering trucks are paneled with, was an inexpensive way to update the look. They splurged on green and white Costa Esmerelda marble counter tops. "It's like an abstract painting. Amazing threads of white in the marble look like clouds," she says. More David Bates paintings hang in the kitchen, and the family's pet Maltese. The master bedroom is a soothing palette of white and silver sage. hangs in the master bedroom, over an antique Swedish settee. "My OCD is cleaning," says Lisa. "My life with work, carpool, and all the pets is so chaotic. That's one reason for the tranquility of the palette." Photo courtesy of Justin Clemons. In the breakfast room, a hanging pendant by David Trubridge is as much sculpture as it is functional. 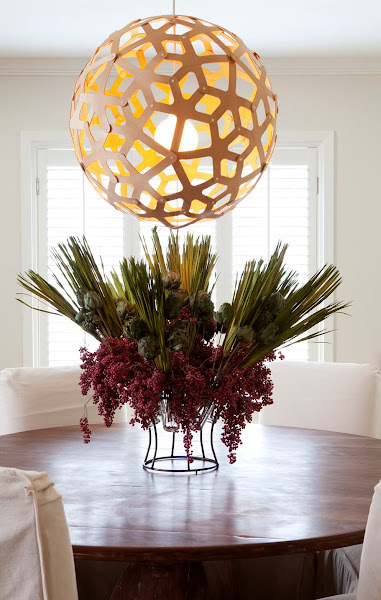 The walnut table was custom made by Old Timber Table Company; a glass vase by Wisteria holds an arrangement of dried artichokes, reeds, and berries that Lisa put together. If Lisa's gallery is full of provocative, edgy art hung on stark white walls, home is a serene haven full of her most cherished possessions and people. "I wanted to come home and breathe. I'm thrilled at the times I can be at home with the animals and the kids. I like coming home, and I'm not sure everyone can say that."